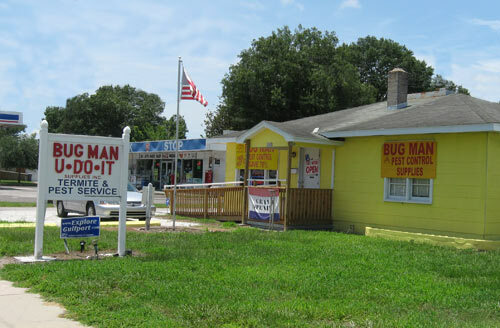 Welcome to The Bug Man website! We appreciate your visit and hope that you will learn some useful information about us and our pest control supplies and service. We've been a family owned, local business for over 30 years. We not only service almost 3,000 accounts year round but we also sell our best products on the market to home-owners. Our address is 5217 Gulfport Boulevard South in beautiful Gulfport. Drop in for a visit or give us a call at (727) 328-2847 for supplies or (727) 323-4008 for service. The only place where you can meet the famous "Hired Killer", Rick McChesney (owner). You can also visit our BUG ZOO, a collection of insects from Pinellas County & around the world!